Your birds have voracious appetites, which can get the best of them. Don't let your chickens eat these common toxic plants. Your free-range flock loves roaming into the garden and treating the marigolds, squash blossoms and dandelions like an all-you-can-eat salad bar. An abundant supply of fresh fruits, vegetables and garden greens is part of a balanced diet, but not all the plants in your garden are good for your chickens. In fact, some are toxic. Below is a list of 14 common farmstead plants toxic to your flock. Don’t feed them these plants or confine them in an area of the garden where these toxic plants are growing, as their appetites might get the better of them. Remember, this is far from a complete list; there are hundreds of plants that can be harmful to your chickens. 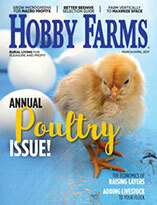 Before opening the coop doors to let your flock forage, do your research to keep your chickens out of harm’s way. Many fruits are safe for chickens, but the leaves and pits of an apricot contain cyanogenic glycosides that are highly toxic, triggering symptoms such as seizures, breathing problems and low blood pressure. When leaves are stressed from frost, drought or disease, the toxicity levels increase. If you want to grow apricot trees, prevent chickens from foraging near the orchard via fencing or other means. These deciduous shrubs are popular in landscapes across the U.S. thanks to their waxy green leaves and colorful flowers. Although azaleas are beautiful, all parts of the plants are also highly toxic and can cause digestive upset, weakness, loss of coordination and cardiac damage. To keep flocks safe, house them away from azaleas or dig up the shrubs and relocate them out of the birds’ reach. Uncooked beans contain hemagglutinin, which is toxic to chickens. You don’t have to banish beans from the garden—just be sure to keep the flock from foraging in beds where beans are growing, and never feed them raw or undercooked beans. 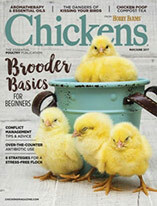 Daffodils, iris, narcissus, tulips and other bulbs are among the first signs of spring in the garden and might tempt chickens with their fresh green leaves and flowers. However, many bulb varieties contain alkaloids that can cause low blood pressure, tremors and diarrhea. Dig up the bulbs and compost them or replant them in areas of the garden the flock can’t access. A specific variety of fern called the bracken fern can cause bracken fern poisoning in chickens, which leads to anemia, weight loss and muscle tremors. Although significant amounts of the plant must be consumed to be toxic, the perennial ferns with their large triangular-shaped fronds are native to most U.S. states, growing in pastures, forests and rangelands, giving chickens in rural areas ample access. The best way to identify bracken ferns is to use a wildlife guide. Because they grow aggressively, you’ll need to be vigilant about removing them. This perennial or biennial is common in the Northeast and along the West Coast. The spires can grow to 8 feet and produce bright tubular-shaped flowers with speckled interiors that blossom in the summer. All parts of the plant—seeds, flowers, stems and leaves—are toxic. Foxgloves reseed prolifically, so getting the population under control can be challenging. It’s best to remove the entire plant, including the roots, from the garden. The glossy green foliage and red berries make this festive evergreen popular for Christmas decorations. Varieties of holly grow across the U.S., but it’s is especially abundant in the Southeast. While holly has a low toxicity level, the leaves contain saponins, which can cause vomiting, diarrhea and drooling in your chickens. Because holly can grow up to 4 feet per year, keeping chickens away from the bushes is easier than digging them up. To ensure that chickens can’t access the plant, keep it trimmed and house the flock at least 5 feet away. The pretty blue, purple, white or red blooms on this annual make it popular for containers, butterfly gardens and medicinal herb gardens. Some lobelia varieties trail while others can grow up to 3 feet tall. 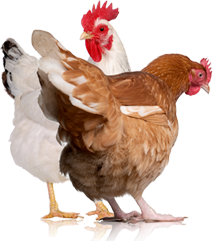 The plant contains toxins called pyridine alkaloids, which can cause tremors, weakness, increased breathing rate and lack of coordination in poultry. Remove annual plants from the garden if you plan to allow your chickens to forage. This herbaceous perennial grows 12 to 26 inches tall and produces bonnet-shaped flowers that grow on a spike. The flowers come in a range of colors from deep blue and purple to pink and white. All parts of lupine plants, which are more common in mountainous areas, contain a toxin called quinolizidine alkaloids that cause nervousness, depression,aimless wandering, muscle twitching and convulsions in chickens. Because it’s difficult to control wild lupines, keep chickens from accessing areas of the farm where lupines grow. There are 70 varieties of nightshade plants, including tomatoes, peppers, eggplant, bittersweet and Jerusalem cherry, many of which can be harmful to your flock. Nightshades contain alkaloids, which cause appetite loss, increased salivation, weakened heart rate and trouble breathing. While it’s OK to throw your flock the occasional tomato, be weary of plants in this family. Raw potato peels, for example, should never be considered a chicken treat. You should also take particular care to keep your flock away from deadly nightshade, found across the U.S. and identified by their five-lobed white-and-purple flowers and green fruits or berries that turn yellow or black at maturity. Because nightshade plants often grow wild in pastures, orchards and along roadsides, removal can be a challenge. Prevent chickens from foraging near the plants. Mature oak trees can grow up to 80 feet tall with canopies spanning more than 100 feet wide. Even on saplings, the elliptical-shaped leaves are too high off the ground for chickens to reach, but the both the leaves and the acorns that drop in the fall contain tannic acid, which can cause lack of appetite, frequent urination, excessive thirst and diarrhea. Instead of cutting down trees, confine chickens to acorn-free areas. Also known as creeping myrtle, periwinkle is a groundcover with dark-green foliage, oblong leaves, and blue, purple or white flowers that appear in early spring. The plants contain cardiac glycosides that are highly toxic and can cause tremors, seizures and death. The fast-growing, shade-loving perennial can be hard to control, so your best bet is to keep chickens confined to a periwinkle-free section of the farm or garden. It might make the perfect pie, but rhubarb leaves contain oxalic acid or oxalates that are toxic to chickens, causing jaundice, tremors and increased salivation. It’s OK to continue growing rhubarb, just restrict the flock’s access to the garden. This ornamental evergreen, known as the “Tree of Death,” is highly toxic. There are several varieties of yew, including the Japanese yew, which is the most common ornamental shrub in the U.S. All parts of the plant are toxic and contain cardiotoxic taxine alkaloids that can cause cardiac arrhythmia and death. The toxins are fast-acting, and a small amount can have a lethal impact. To be safe, remove all yews from the landscape if you free-range your flock. While plenty of vegetation is safe for your chickens, it’s important to understand which plants could pose a danger to their health. Remember, this is not an exhaustive list: To keep your chickens safe, do your research. The payoff is a healthy and productive flock.